For the ‘curtain-raiser’ this week our Men’s Divvies have posted one of their strongest selections in recent weeks despite some players being called for higher service. In the hopes of finishing with a flourish, we see a combination that finally gives Heppy a rest, Haydn Jenkins and Horton pair as locks and the loosies include Horan, Makaroff and Samayoa. The backs include Logan and Dalsin back from an injury layoff. This group will severely test the Hornets. The main game features a Hornets selection that includes names not particularly familiar to this pundit although there are some notables including Halaliku and Fowler. Missing is their rising star, Jared Stephens, a centre three-quarters of some note. The team looks to have a strong ‘Islanders flavour’ to it, players who always play full-on and enjoy the fray. Their record has shown considerable improvement and the ability to score points, surprising a number of more storied clubs this season. Their results such as; 30 – 30 tie with Rowers; 37 – 14 win over Seattle; 36 – 11 win over Caps; 21 – 25 Vs UBC; 38 – 41 Vs Caps; and 32 – 50 Vs UVic are not to be dismissed lightly. We can expect more of the same as they seek to erase memories of a wet day back in September at May Bennett. 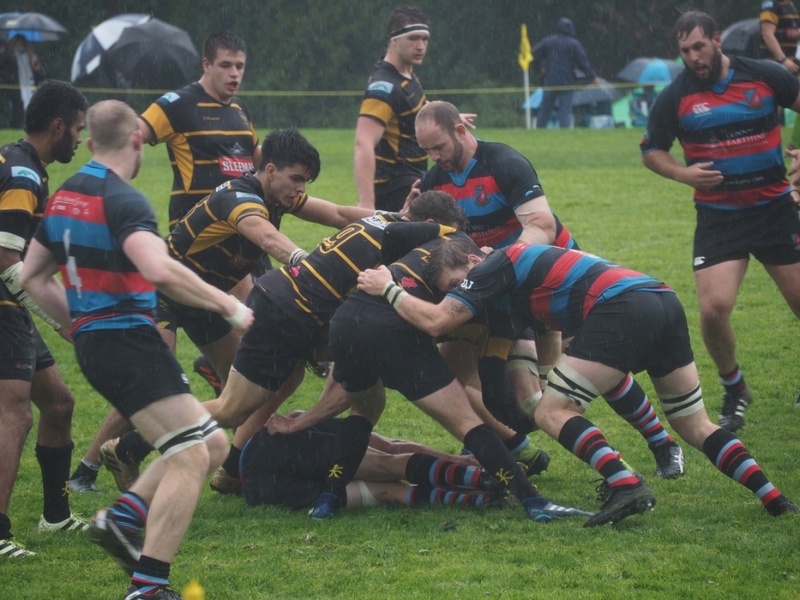 For the hosts we see a number of changes in the forwards made necessary due to a very hard match against Burnaby last week. Captain, Stewart takes a spell, Mike Finnemore likewise, Ilnicki has retained his spot over Hohert and Herron is nowhere to be seen. It is interesting to see Haydn Evans name on the bench, obviously recovered in a shorter span than expected. This man was a bull in September. Chiz looks like he finished unharmed last week despite a facial of sheer agony and that’s good news. Ilnicki is certainly hitting straps of yore and it is a real benefit to have last week’s Hard Hat, D.D. back at #8. The starting backline remains as was vs Burnaby although it is apparent that the #9 spot is being shared equally between Schelly and Pits, further, Morra’s name is on the bench. In all, this should be another exciting contest at The House. Of course, the added interest of the first try scorers and the introduction of the 16TH MAN should assure a good attendance. A prediction? CW with a bonus point, no guess at points against.